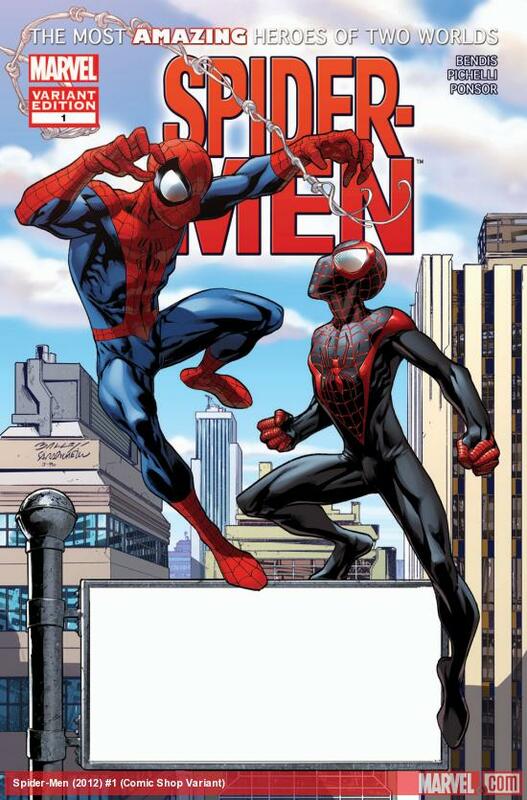 Spider-Man #1 has come and gone, and it's a pretty good story so far. More importanly, the issues brings along with it a slew of comic shop retailer variant covers. Marvel invited comic shop retailers to purchase a minimum of 500 copies to get their own personalized cover to the issue. This issues joins the ranks of Amazing Spider-Man #666, Amazing Spider-Man #669, Avengers X-Sanction #1, and Avengers Assemble #1 to offer an exclusive retailer variant. The number of participating stores has dropped for each issue, however even the minimum 12,000 additional issues sold for Spider-Men #1 will probably means it's a modest success for Marvel and may foretell more to come.